Bolton manager Owen Coyle admits that "there is merit" in completing Gary Cahill's proposed transfer to Chelsea "as soon as possible". Chelsea have had a bid accepted for the England centre-half, who scored the winner . Coyle told BBC Sport: "If it's to be done early, then great. We will adjust. "I would expect in the next couple of days that there will be further dialogue between Gary's representative and Chelsea." The deal to take Cahill to the London side, who are short of cover in central defence with Brazilian Alex out of favour after handing in a transfer request, is thought to be worth £7m. Cahill is out of contract with Bolton at the end of the season and BBC Sport understands Wanderers intend to reinvest all of the funds from his sale in new players. Coyle said: "There was one initial meeting between Gary Cahill's representative and Chelsea football club. We've agreed a fee. "Chelsea respected the fact that we had a game at Everton and we needed him focused. "From now on it is up to the two of them to come to some sort of an agreement. "There's merit in getting the deal done as soon as possible. Gary Cahill is an outstanding young man and he has aspirations of playing at the highest level, in the Champions League and for his country. "He's so patriotic and loves representing England. He probably feels that there are better chances of doing that at a bigger club. I don't have any argument on that. "If it's not done, then I've got a fantastic player who can only help us in the position we are in." Chelsea boss Andre Villas-Boas is confident a deal can be struck, despite confirming last week that club and player are "miles apart" over personal terms. "We're still miles apart regarding agreement with the player," he said. "We'll continue to monitor this situation as we continue to monitor others." 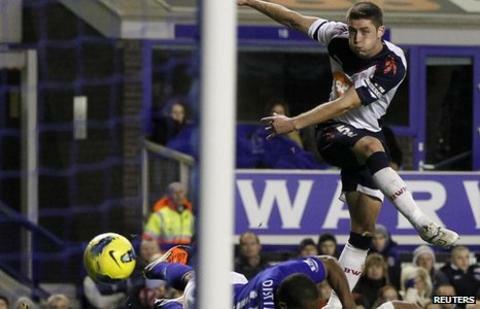 Cahill scores for Bolton against QPR. Pictures courtesy of the Premier League. Villas-Boas did, however, confirm his admiration for the England international. "I think his technical attributes are immense and his pace is fantastic as well," he added. Villas-Boas revealed midfielder Josh McEachran would not be joining Bolton on loan but could move to another club. Cahill, who joined Bolton in a £5m move from Aston Villa in January 2008, made his England debut against Ghana in March 2011 and scored his first international goal in the 3-0 victory over Bulgaria in September. Bolton have been linked with New York Red Bulls defender Tim Ream, who recently trained with the club.